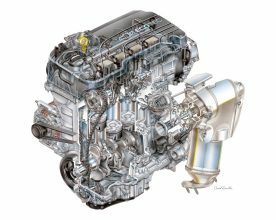 Chevrolet will add a new “clean diesel” engine to the lineup in 2017, featuring a B20-capable 1.6-litre diesel already proven in Europe and other global markets. B20 is a bio-diesel with 80% content petroleum-diesel. Meanwhile, the 2016 Chevrolet Cruze is powered by General Motors’ new, global family of Ecotec small-displacement engines, featuring a modular architecture that is easier to build and adaptable to global markets, while offering customers segment-challenging efficiency, refinement and durability. The Ecotec 1.4-litre gasoline engine will be assembled in Flint, Michigan. with locally and globally sourced parts. GM’s engine facility in Toluca, Mexico will also build the 1.4-litre unit, as well as the Ecotec 1.5-litre gasoline engine. Sutter is confident that with the company’s home advantage, GM will “compete at the very top” of the segment. Meanwhile, in North America, Cruze (below) is offered with a “new” Ecotec 1.4-litre turbocharged gasoline engine that features direct injection to help offer a GM-estimated 40 mile/gal on the highway with an available six-speed automatic transmission. Standard stop/start technology contributes to efficiency in stop-and-go driving. The new 1.4-litre turbocharged gasoline engine is SAE-certified at 113 kW (153 bhp) and 240 Nm of torque (177 lbft), using regular unleaded fuel (RON 91). It will be offered in additional markets, along with a 1.5-litre naturally-aspirated gasoline variant rated at an estimated at 84 kW (113 bhp) and 146 Nm of torque (108 lbft). The 1.5-litre will be mated with a five-speed manual transmission. The new Ecotec 1.4-litre turbo engine is matched with a standard six-speed manual or available with GM’s new Hydra-Matic 6T35 six-speed automatic transmission. It offers the strength of the larger 6T40 transmission in a smaller, lighter package that enhances efficiency in the compact Cruze. The new Ecotec small-displacement engine family (pictured below) featured in the Cruze represents a clean-sheet design and engineering process, leveraging the diverse experience of GM’s global resources. Modularity in parts – such as four-cylinder and three-cylinder blocks – that share bore spacing, bore diameter, liners and other dimensions, reduces complexity and enhances value. 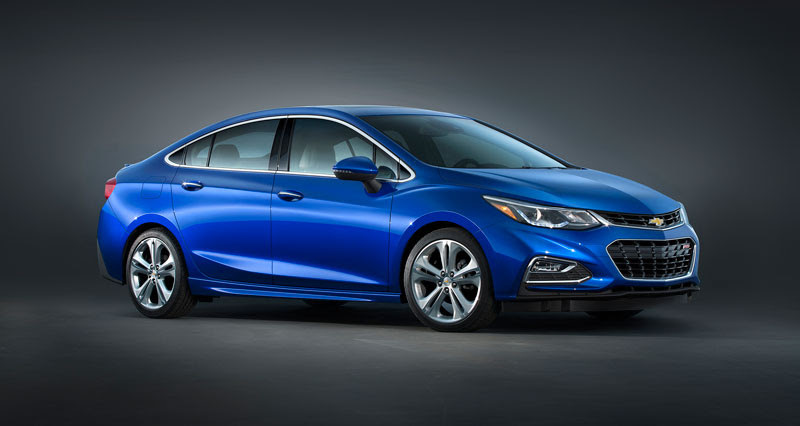 The new engines feature an aluminium cylinder block and head, which GM claims “helps reduce the Cruze’s overall mass to enhance performance and efficiency”. They also feature an integrated aluminium cylinder head/exhaust manifold, which further reduces weight – an attribute that contributes to increased vehicle efficiency and a more favourable front-to-rear weight balance, for a more responsive driving experience. Additionnal features include an aluminium bedplate on the engine block which GM claims enhances strength and refinement. However, extensive use of aluminium in the engine given scant recognition of the high energy consumption of aluminium compared to cast iron in the foundry process. GM claims also: Variable-flow oil pump enhances efficiency; Piston-cooling oil jets contribute to optimal performance, efficiency and refinement; Dual-overhead-cam cylinder head with integrated exhaust manifold saves weight to enhance performance and efficiency; and “Premium” inverted-tooth camshaft drive chain contributes to segment-challenging levels of refinement and low noise. The engines also have powder met steel connecting rods. Computer simulation and modelling were instrumental in developing the new engine family. GM’s engineers at powertrain centres around the world could design and test parts virtually and immediately share the results with their colleagues. In addition to designing the engines’ basic components electronically, friction, temperature, emissions, efficiency and other performance attributes were modelled and simulated multiple times to make the most of performance before the first physical components were produced. GM engineers claim modelling also helped cylinder block design and other components with structural and acoustic considerations. “By doing the majority of the development with math data, the time to design, validate and bring to market an all-new engine family was greatly reduced,” claims Sutter. GM engineers claim a lightweight, high-pressure die-cast aluminium block is the engines’ foundation, matched with an aluminium bedplate that enhances strength and helps reduce vibration. The high-pressure casting method produces a more dimensionally accurate block that requires fewer machining operations than conventional sand-cast blocks. For structural stiffness, the block has cast-in-place iron cylinder liners. The bedplate bulkheads also contain cast-in, nodular iron inserts for localized structural stiffness. A die-cast aluminium oil pan contributes additional structural strength. Each engine features 74 mm (2.9-inch) cylinder bores and comparatively long piston stroke lengths that contribute to their strong torque. The 1.4-litre has an 81.3 mm (3.2-inch) stroke and the naturally-aspirated 1.5-litre version has an 86.6mm (3.4-inch) stroke.